Watford continued to go from strength to strength as they inflicted Manchester United's third consecutive defeat with an impressive home victory thanks to goals from Etienne Capoue, Juan Zuniga and a late penalty from Troy Deeney. Marcus Rashford had equalised on the hour, but the Hornets continued to plug away backed by the intensity of the home crowd. United were going into the match still wounded from two consecutive defeats to Manchester City and Feyenoord in the past week, looking to recapture the form that had established them as unanimous title favourites at the end of August. With talisman Zlatan Ibrahimovic back on the teamsheet after starting the Europa League encounter on the bench, the visitors were expected to make easy work of the Hornets. However, this Watford side were rejuvenated after a thrilling comeback win at West Ham last week, and in Etienne Capoue possessed the best breakout star of the season so far. A quarter of an hour in to proceedings, and the home fans were left gobsmacked thanks to a miss of the season contender from Odion Ighalo. David De Gea and Chris Smalling both lunged for a aerial pass forward, with the goalkeeper dropping the ball as he collided clumsily with his teammate on the edge of the box. It fell to Ighalo, goal gaping, but the Nigerian striker horrendously sliced his shot wide much to the despair of the Vicarage Road crowd. Watford's good spell continued as Troy Deeney got in on the act to thump a header at goal, forcing a flying save out of De Gea. United reacted promptly, clearly not having it all their way, by getting Ibrahimovic involved at the other end. The Swede's strike rattled the side-netting though, not quite the knockout blow United were hoping for. 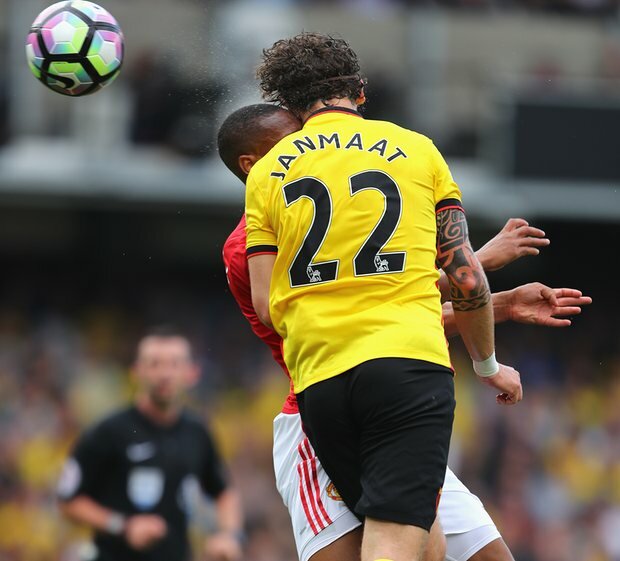 An aerial clash of heads between Martial and Janmaat caused a break in play just as United found their groove, dominating possession and working hard to break down the Watford wall after 30 minutes of untidy, nervous football. Paul Pogba then tried his luck in trademark style, having a blast on goal from distance, the ball thudding against the crossbar to set the pulses racing inside the stadium. It proved to be their last telling chance of the half though, as Capoue once again found himself in the right place at the right time to sidefoot home from inside the box. The French anchorman has now scored 4 goals in the Premier League this season, having managed just a solitary strike in his past three seasons combined. The equaliser came soon after, Marcus Rashford played an intricate one-two with Ibrahimovic before pedalling off into the box to get on the end of the dinked cross, eventually tapping the ball in past the sprawling Gomes. United kept churning away, and Ibrahimovic almost gave his side the lead with a powerful header that had to be beaten away by Gomes - an exact replica of Deeney's attempt earlier on. 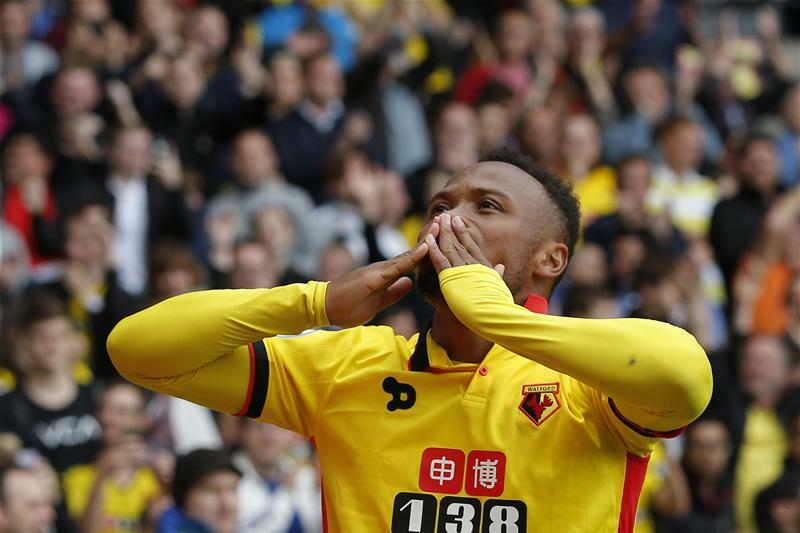 Capoue exited the field of play to a rapturous ovation, and on came Juan Zuniga for the last eight minutes. The Colombian took just over a minute to announce himself, pinging the ball past the helpless De Gea with his first touch of the game after Pereyra's exquisite cutback. Deservedly so the home side were in the ascendancy again. 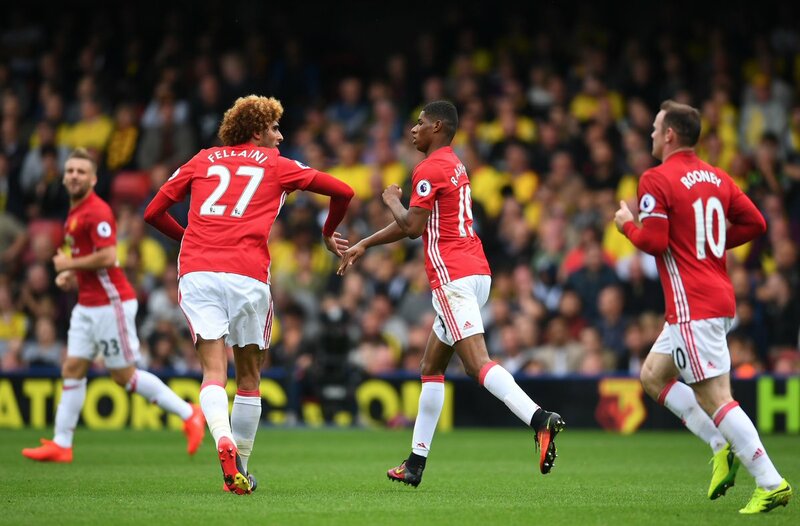 On course for their first triumph against United since 1986, Watford kept working well into injury time, and Zuniga bamboozled Fellaini with a clever piece of skill to draw a foul and earn a penalty. Troy Deeney slammed the ball home to seal the deal, and that was all she wrote. A fine display by Watford lifts them to 8th in the table, while United have missed an opportunity to leapfrog Liverpool, Chelsea and Arsenal with victory.